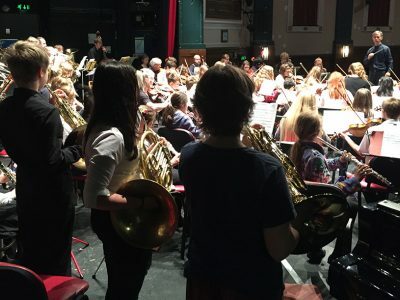 The Scottish Schools Orchestra Trust (SScOT) has been running non-auditioned residential courses in orchestral and wind band playing for children aged 9-15 during the summer holidays since 1985. Over this time we have built up a reputation for excellent teaching in a supportive and nurturing atmosphere, with participants returning year after year. 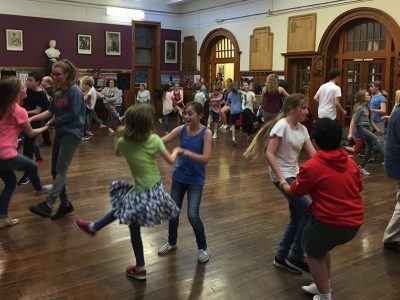 These summer courses now attract at least 80 children each year from all over Scotland and beyond. Learn more about our summer courses here. 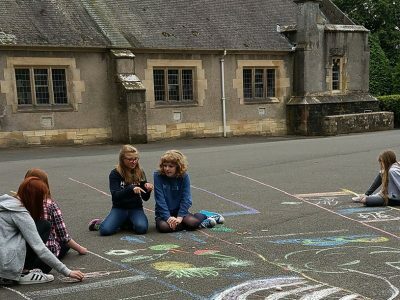 We also hold two Play Away Days each year – single day events where children aged 8 and above join forces to form a wind band and a string orchestra in a day, culminating in a concert for family and friends. Learn more about our Play Away Days here. It is well known that group music-making has many personal and social benefits as well as musical ones, and our courses give children the opportunity to meet like-minded people from all over Scotland and elsewhere, whilst developing personal qualities including a sense of responsibility, self-awareness, self-esteem and the ability to work as part of a team. We believe whole-heartedly that music-making should be encouraged at all levels, and we aim to support all young musicians, whether they plan to study music at college, at school or at home, or are just starting out on their musical journey. There are social and emotional benefits of playing music in a group at all levels, and we hope to develop an ongoing passion in those who will become the performers, audiences and supporters of the arts in the future. Unlike many holiday music courses, we do not audition, and we accept all applicants who fit the age criteria and are able to play at grade 2 standard or above. Our aim is to challenge all participants at their own level, and to build on their own motivation and enthusiasm. Our instrumental tutors are all extremely experienced in group teaching at different levels. SScOT is run by a dedicated team of Trustees, and a management committee made up of parents and staff that determines the activities of the organisation. The day-to-day running of the organisation is carried out by our Director, Kate Whitlock. Information about our musical staff is available on the individual course pages. Kate spent many happy years as a child taking part in holiday music courses and youth orchestras as a keen violinist. 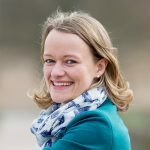 Following a four-year diversion to study maths, she rapidly returned to the musical world as a freelance arts manager and producer and has been running education and development projects for children, young professionals and established musicians since 2009 at organisations including the Royal Scottish National Orchestra, London Symphony Orchestra and Aldeburgh Music. As well as working with SScOT, she is Producer of the East Neuk Festival and a Project Manager for Live Music Now Scotland.